"Agility and Manageability, Simple and Intuitive Dashboard, New Composite Door, New Engine Compartment". Maximum capacity (kg): 2.500, Maximum lifting height (m): 5,78, Maximum horizontal outreach (m): 3,25. Machine is not suitable for towing trailers on public roads and roads for public use, tyre approval as a driving agricultural machine. Maximum power kW (hp): 62,5 (85), 4 stroke diesel, electronic direct, 4 cylinders in vertical line, engine size of 3319(cm3). Turbo compressor and liquid cooling system. Anti-tripping device with pejorative movement block. Hydraulic socket for any accessories on the boom head. Soundproof closed cab, ROPS-FOPS approved, with heater. Self-blocking front axle differential (limited slip 45%). hydrostatic transmission with variable flow pump. Hydrostatic engine with automatic variation. Electrical - hydraulic inversion. Inching pedal for controlled advancement. "Great agility and reduced steering radius, Low consumption engine, 360 degrees cab visibility". "Performance varies on the model of the Agri Farmer". Maximum horizontal outreach (m): ranges between 3,25 - 5,70. Maximum power kW (hp): 74.5 (101), 4 stroke diesel, direct mechanical, 4 cylinders in vertical line, engine size of 4400(cm3). Anti-tripping device with pejorative movement block. Hydraulic socket for any accessories on the boom head. Soundproof closed cab, ROPS-FOPS approved, with heater. Self-blocking front axle differential (limited slip 45%). Self-cleaning filter with cyclone filters. Electric window winder. Hydrostatic transmission with variable displacement pump. Hydrostatic engine with automatic variation. Electrical - hydraulic inversion. Inching pedal for controlled advancement, Servo controlled 2-speed gearbox. Standard bucket capacity (m3): ranges between 0,75 - 0,95. 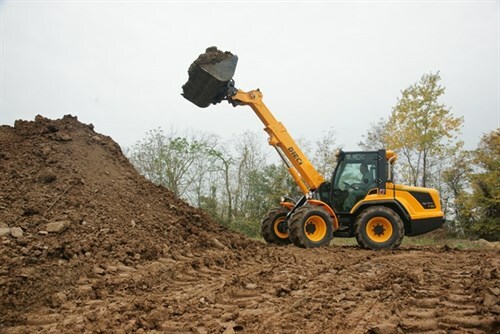 Operating load with standard bucket (kg): ranges between 4850 - 6020. Maximum power kW (hp): 36,5 (50), 50 (68), 55 (75). 4 stroke diesel, direct mechanical and direct electronic, 4 cylinders in vertical line. Hydrostatic transmission with variable capacity pump and hydrostatic engine with automatic adjustment. Number of speeds, forward - reverse. Inching pedal for controlled advancement. T60: Mechanical transmission. Fuel tank 100 litres.